LS-F3008 is a 96-well enzyme-linked immunosorbent assay (ELISA) for the Qualitative detection of Human CLOCK in samples of Adherent Cell Cultures. It is based upon a Cell-Based assay principle. Add 50 µl of 1x primary antibodies and incubate overnight at 4°C. 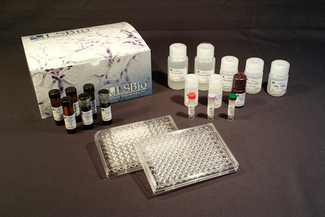 Add 50 µl of HRP-conjugated secondary antibodies and incubate for 1.5 hours at room temperature. Add 50 µl of Stop Solution and read OD at 450 nm.